Paper Makeup Stamps: Paper Makeup Stamps Blog Hop! 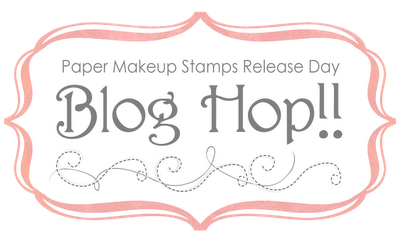 Welcome to the Paper Makeup Stamps release blog hop! Yes that is a mouthful! But we are so happy you are here! The design team has taken stamps from our January/February release and created some amazing cards and projects for you today! So grab your bevvie of choice and a pen and paper! Why the pen and paper? Because we have a super secret voucher code for you if you do the hop! Each blog will have a letter for you... collect all the letters and you'll have a phrase that you will enter in the voucher box (in your shopping cart) and it will nab you 15% off every stamp in the new release! Including the kit! This code can't be used with other voucher codes, so save those other ones for later! Also, remember you dont need spaces or anything if the phrase has more than 1 word. All of the stamps and new products will launch tonight at 9pm EST. This is the same time that we start the parrrrtay in the PMS forum! We would love for you to join us! We always have lots of fun chatter (mostly about food, so you may want to eat before you come or you'll get hungry!) and we play games, give some stamps and goodies away and sometimes even come up with ideas for future stamps! You really don't want to miss it! Ok ok, i've babbled on long enough. Time to get hopping! Your first stop is the amazing Tangii Crain! Wonderful hop. I love seeing everyone's work. Thanks to all for sharing. Was a great hop. Everyone work was marvelous.